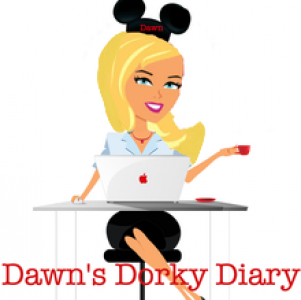 Disney’s Typhoon Lagoon versus Disney’s Blizzard Beach – Travel, Family & Fun rolled into one! First things first, both waterparks are distinctively different aesthetically. Typhoon Lagoon has more of a tropical island vibe whereas Blizzard Beach has a winter snowstorm feel. Both exciting in their own right, now let’s see the differences between the two, so you can help my family select a waterpark for our July 4th Walt Disney World vacay. Shark Reef~ Snorkel in this 362,000 gallon tank filled with stingrays, tropical fish and don’t forget SHARKS-eek! Surf Pool~ Catch a wave in this gnarly wave pool with surf lessons available before park opening. If you would like to take part in this unique adventure call 1-407-939-7529, the cost is $165 per person. Get your wave on! Crush ‘n’ Gusher~ a multi-person water-coaster ride, hold on tight! Chair Lift~ Gondola style ride to the top of Mount Gushmore, hope you’re not afraid of heights, lol. Teamboat Springs~ a multi-person whitewater raft ride, great for the entire family. Summit Plummit~ 12o foot long slide resembling a ski jump with a daring 12 story drop at speeds of 60 MPH, Holy Guacamole’! 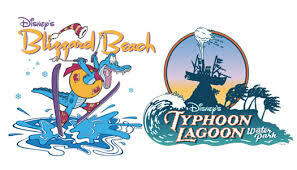 * Disney’s Typhoon Lagoon is also the older of the two waterparks with its grand opening June 1989 and Blizzard Beach following in April 1995. *Disney’s Blizzard Beach is the largest of the two waterparks. *Bring your own beach towels to the waterparks or you will pay a $2 fee to rent a towel and who really wants to do that, not me. *Both waterparks have locker rentals; small $8 a day plus $5 refundable key deposit and large for $10 a day plus $5 refundable key deposit. *Both have private Cabana rentals~ Typhoon Lagoon has Beachcomber Shacks and Blizzard Beach has Polar Patios with room for six, they include beach towels, attendant on call, private locker and drink mugs with shaded comfy patio furniture. Full day rental costs $345.06 and half day is also available, if interested call~407-WDW-PLAY. Both waterparks also have umbrella and chair rentals available and plenty of free lounge chairs located all over the water park. Fun, fun, fun in the sun, is what you will have at these thrilling water experiences. Bay Slides, Castaway Creek (Lazy river 2,000 foot long route with 5 landings along the way), Crush ‘n’ Gusher, Gangplank Falls, Humunga Kowabunga, Keelhaul Falls, Ketchakiddie Creek, Mayday Falls, Storm Slides, Shark Reef and Surf Pool. Chair Lift, Cross Country Creek (Lazy river 3,000 foot long route with 7 landings along the way), Downhill Double Dipper, Melt-Away Bay, Run Off Rapids, Ski Patrol Training Camp, Slush Gusher, Snow Stormers, Summit Plummet, Teamboat Springs, Toboggan Racers and Tikes Peak. Whether or not you’re hungry for a snack, meal or you just need to quench your thirst, check out both waterparks dining establishments. Avalunch, Cooling Hut, Frostbite Freddy’s Frozen Freshments, I.C. Expeditions, Lottawatta Lodge, Mini Donuts, Polar Pub and Warming House. If shopping is something you can’t shy away from, then you’re in luck at both waterparks. I really don’t think you could go wrong with either waterpark and unfortunately this article has only made this choice more difficult for us. They both seem amazingly gnarly. Please help us, let me know your favorite or reasons why your family prefers one over the other. HELP me, I’m Disney drowning! Previous Post Walt Disney Quote of the Day! Completely depends on the day you want. If you are looking for more relaxation I’d go to Typhoon Lagoon. If you are looking for a more adventurous thrilling day go to Blizzard Beach. Cant go wrong at either! Kyle, thx~ I’m all about relaxation and I’m leaning towards Typhoon Lagoon! I loved loved loved typhoon lagoon!!! Thanks for the scoop! Cheryl, I Think I’m leaning towards Typhoon Lagoon!